In a previous post I talked about the scoring guidelines for new top growth, for topped carrots. But what if you encounter new root growth? Is it a defect? And if so, how much is allowed? 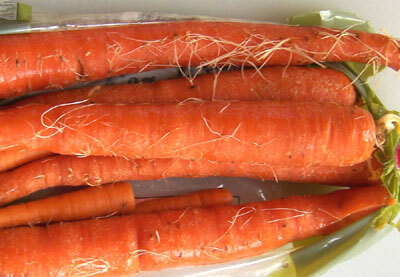 New root growth, as seen here, will exhibit small, whitish color threads or roots, growing from the carrot. This defect is usally found from carrots being shipped late in storage. The new roots will continue to grow, and they may become discolored or even decay over time. The USDA Inspection Instructions do not offer any specific scoring guidelines when you find this defect. When you find this defect you will have to resort to the general definition for damage, and score the individual carrot when you find the new root growth objectionable. I would find all of these carrots, showing new root growth objectionable. But what if you only find slight new root growth? 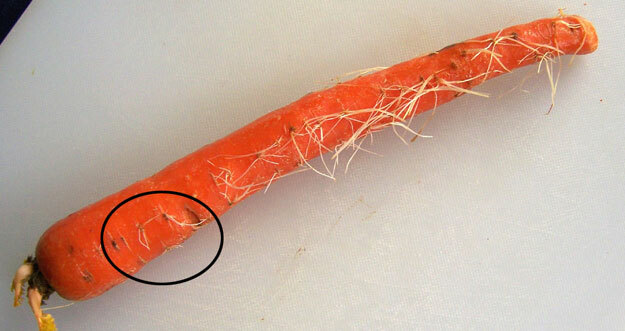 Looking at the image above, let’s assume only the circled area was showing the new root growth, and the remainder of the carrot was fine. I would not score the carrot as a defect, under this scenario, but would state this would be the maximum amount of new root growth allowed, before scoring as a defect. The US Standard for Topped Carrots does allow new root growth to be scored as damage or as serious damage. If you found the defect as being objectionable, as materially affecting the appearance, the individual carrot would be scored as damage, against the total tolerance for defects, 10%. If you found the defect to be seriously affecting the appearance, as all the carrots with new root growth shown in the two pictures above, then the carrots would be scored as serious damage, against the 5% tolerance for serious damaage defects.